Only days after calling on Democratic Sen. Al Franken (Minn.) to resign, liberal New York Times columnist Michelle Goldberg walked back her comments and said she was torn on the issue. "Franken Should Go," wrote Goldberg on Nov. 16 in response to the news that the Democrat had been accused of groping and forcibly kissing a woman while on a USO tour. Goldberg admitted her first instinct was that Franken should stay in the Senate until the Ethics Committee investigation had concluded. "But if that happens, the current movement toward unprecedented accountability for sexual harassers will probably start to peter out," she initially argued. 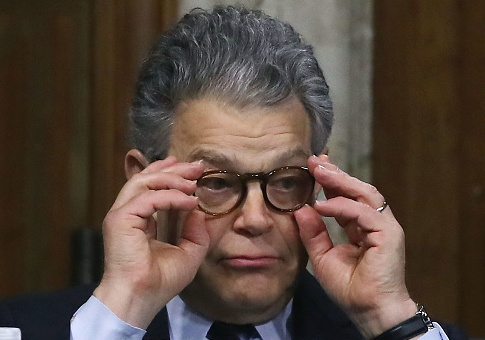 "I would mourn Franken’s departure from the Senate, but I think he should go, and the governor should appoint a woman to fill his seat," she wrote. "The message to men in power about sexual degradation has to be clear: We will replace you." But only four days later, Goldberg suddenly backtracked in a piece headlined "When Our Allies Are Accused of Harassment." Goldberg wrote that almost as soon as her first piece was published, "I started having second thoughts. I spent all weekend feeling guilty that I’d called for the sacrifice of an otherwise decent man to make a political point." Adding that she was "torn by competing impulses," Goldberg said she was "partly persuaded" by the argument that liberals shouldn't condemn men accused of sexual harassment when those men supported the party line on women's rights. "It’s easy to condemn morally worthless men like Trump; it’s much harder to figure out what should happen to men who make valuable political and cultural contributions, and whose alleged misdeeds fall far short of criminal," Goldberg now writes.